The third member of the talented panel for our Swingset Skirt sew-along is Meredith, whose impeccable sewing has been featured on the blog in the past here and here. The sew-along begins next Monday, and if you haven’t picked up a copy of the pattern for yourself so you can join us, don’t delay! The pattern is available in paper or in digital form. 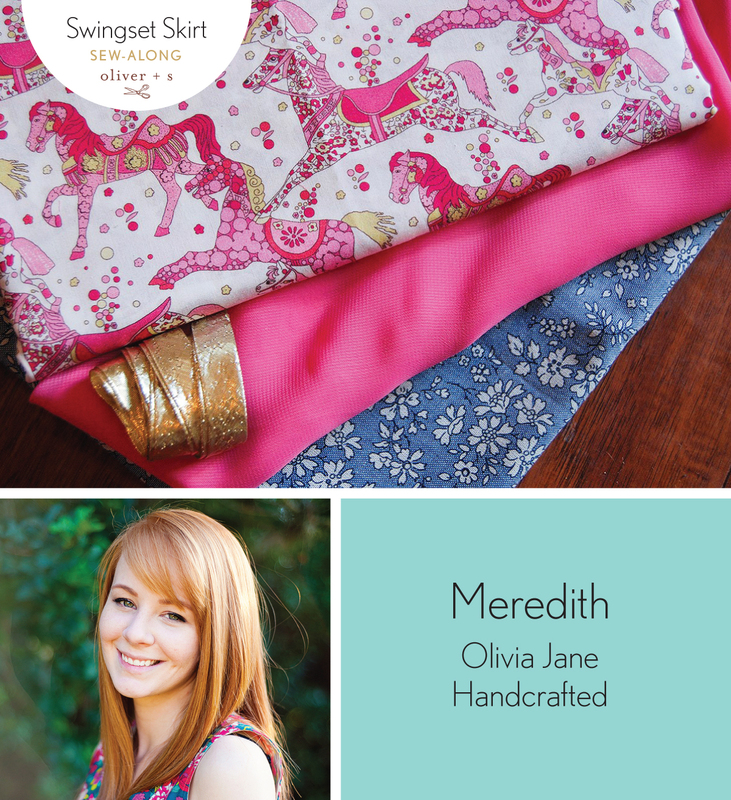 Meredith always has such great taste in fabrics, let’s see what she has prepared for her skirt. Hi! I’m Meredith and I blog over at Olivia Jane Handcrafted, though I’m always popping in on Instagram showing sneak peeks of whatever I’m working on, which is always something! I enjoy the full spectrum of sewing, from garments to quilts to bags to home things, I really do love to do it all. I have a five year old daughter and an 18 month old son, and another boy on the way. When I’m not homeschooling or chasing them around, you’ll find me stitching something! Fabric: I’m using two main fabrics, a floral chambray and tana lawn horse print from Liberty and pairing it with a hot pink georgette. The main fabrics will be the outermost and innermost layers and the georgette will be in the middle, making this ultra girly skirt full and reversible. Size: I’m making a size five for my five year old. Modifications: As I mentioned, I’m attempting to make my skirt a little fuller and reversible. Since I want that pink georgette to peek through, I’ll be using the main template for that layer, and the two outer layers will be slightly shorter using the lining template. I’m also going to use this gold bias tape to bind the hem of the pink georgette, rather than using a standard hem. I will be using French seams on all layers of the skirt. Sewing notes: I’ve made a couple of Swingset skirts for myself to see me through my maternity phase. I realized that I don’t need to have the drawstring show, though I do love the adjustment aspect. So I will use a drawstring for just one layer (most likely the chambray side) and when it’s worn on the reverse it can be hidden inside. I haven’t come to a final decision on whether I will use ribbon or some of the pony fabric for my drawstring. Plans for styling it: My daughter is in a skirt phase these days, so making this skirt couldn’t come at a better time. I’ve made her many a Liberty skirt and she will pair them with whatever t-shirt she’s in the mood for, which is often a Minion or Gators shirt, and will often wear glitter shoes. She has a style all of her own. I guess we’ll see what she comes up with for this skirt! Full AND reversible! Great idea. Sounds great, Meredith! I’m looking forward to seeing the end result! Oh and I also love the idea of using bias binding to make it reversible. Very clever!